The "Smart Home For Your Boat" Makes the Finals! The “Smart Home For Your Boat” Makes the Finals! You are here: Home / General / The “Smart Home For Your Boat” Makes the Finals! Find a full list of the finalists here! Barnacle Systems is a startup based in Victoria, BC, that was founded in July of 2017. We have developed BRNKL, an IoT connected device, for people who suffer from “boater’s anxiety” and need to know the health and status of their vessel remotely from their smartphone or tablet. Like a ‘smart home’ for your boat users can see inside of their vessels using the onboard camera while also monitoring critical alerts such as low batteries, loss of shore power and high-water. Unlike the competition BRNKL allows you to receive alerts from impacts on your vessel and also allows you to see inside of your boat with the onboard camera. View the finalist profile on Viatec’s website here. 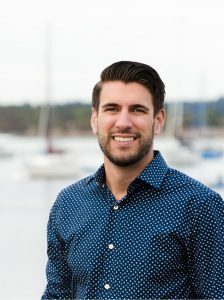 Brandon received his Bachelor of Electrical Engineering from the University of Victoria, and is Pragmatic Marketing Certified (PMC) level 5 for Product Management. He has over a decade of experience developing remote monitoring systems for both environmental monitoring and military surveillance as a Product Manager and Professional Engineer. He has designed and developed award-winning surveillance solutions that have been successfully installed throughout North America, the Middle East and Europe. He has had the honour of presenting remote monitoring solutions to the retired US Secretary of Defense, the Assistant Chief of Staff of Qatar, and various four-star generals from the US, Israel, and Mexico. In addition to his remote monitoring resume, Brandon has also developed bespoke surveillance systems for world-class super-yachts and super-yacht marinas, which originally piqued his interest in the marine-surveillance world. View Brandon’s finalist profile here.